A presentation slide that appears to confirm upcoming laptops featuring Nvidia GeForce GTX 1660Ti and GTX 1650 GPUs has been leaked. The slide is claimed to be from an Acer presentation and was shared by VideoCardz and I_Leak_VN on Twitter - but the original Chinese language source page seems to have been taken down. These are Nitro branded gaming laptops and the slide compares 'old and new'. The laptop in the leftmost column is the existing 15.6-inch Acer Nitro 5 AN515-52 which you can read about in depth on the official Acer product pages. 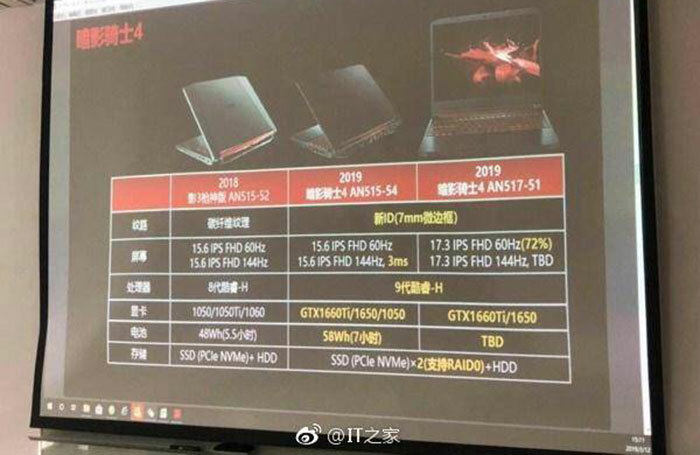 To the right of this laptop are two columns outlining the specs of new and unannounced Acer Nitro Gaming laptops, the 15.6-inch Acer Nitro 5 AN515-54, and the 17.3-inch Acer Nitro 7 AN517-51. In the first column you can see that the new generation Nitro gaming laptops feature a new carbon fibre textured finish. Furthermore, the screen bezels have been reduced to 7mm (applies to the left and right only, it appears). Next we see that there are some screen updates available. For example, the new Nitro 5 AN515-54 has the option of an FHD 144Hz panel with 3ms response time. The third colum says that these new laptops come packing Intel's 9th Gen Coffee Lake H series CPUs. The fifth and sixth rows provide info on batteries and storage available. Of particular appeal will be the inclusion of two PCIe NVMe M.2 SSD slots. Moving on to the graphics card options for buyers, the 15.6-inch model can be configured with a choice of Nvidia GeForce GTX 1660Ti, GTX 1650, or GTX 1050 GPUs. The 17-incher doesn't offer the GTX 1050 option. This part of the listing is significant because Nvidia hasn't officially made any mention of a GeForce GTX 1650 for desktop or mobile. The VideoCardz report says that the desktop variant of the GTX 1650 is expected to come packing 4GB GDDR5 memory across the 128-bit interface and will launch on or around 22nd April. It adds that the mobile variant will arrive in line with the launch of the 9th gen Intel Coffee Lake H platform. 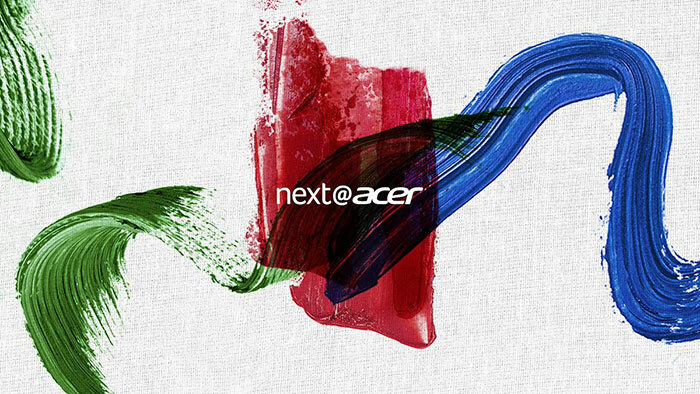 Meanwhile, I've been emailed by Acer about its upcoming product splurge dubbed next@acer, which takes place in New York on 11th April (11am EDT, 5pm BST). The event will be live-streamed on YouTube.